A restrictive cardiomyopathy results in severe diastolic congestive heart failure with intact systolic function. This is due to significantly impaired left ventricular relaxation, which results in increased cardiac pressure and clinical manifestations of congestive heart failure. Restrictive cardiomyopathy manifests as congestive heart failure. This will result in low cardiac output symptoms and transmission of the increased left-sided cardiac pressures into the lungs causing pulmonary edema and a sense of dyspnea. With physical exertion the heart demands increased cardiac output that cannot be satisfied in states of heart failure, and thus left heart pressures increase significantly causing this transient pulmonary edema. As those increased pressures from the left heart affect the right ventricle, right heart failure can ensue. The most common cause of right heart failure is left heart failure. Right heart failure symptoms include lower-extremity-dependant edema. When the legs are elevated at night, the fluid redistributes centrally causing pulmonary edema resulting in orthopnea (dyspnea while laying flat) or paroxysmal nocturnal dyspnea (PND). Hepatic congestion can occur causing right upper quadrant abdominal pain. Symptoms related to low cardiac output include fatigue, weakness and, in extreme cases, cardiac cachexia can occur. Diagnosis can be made via echocardiography and, in some cases, cardiac biopsy. 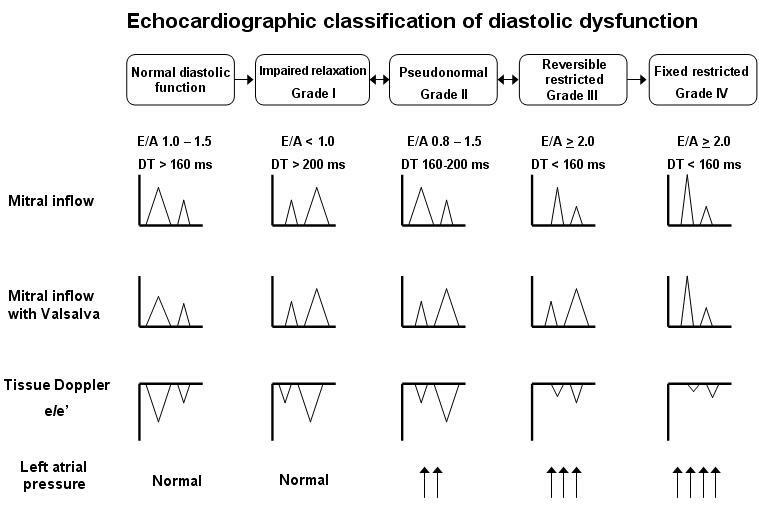 Echocardiography will reveal normal left ventricular systolic function with significant diastolic impairment, frequently grade III or grade IV diastolic dysfunction (see image below). The left and right atrium may be markedly enlarged and a pericardial effusion may be present. The myocardium itself may exhibit a “starry-sky” or a “speckled” appearance if amyloid cardiomyopathy is the etiology. Pulmonary hypertension is commonly present due to the left heart failure. Amyloid protein deposition can be seen as apple green birefringence upon microscopic examination. Iron deposition can be detected by biopsy, as well. Treatment is aimed at the primary etiology, if possible; however, no specific therapy exists to improve outcomes in regard to the congestive heart failure that manifests. Diuretics are used to relieve symptoms of dyspnea from volume overload. Beta-blockers and ACE inhibitors have not been extensively studied in this setting and are not commonly used. Heart-liver transplantation is used for amyloid cardiomyopathy with a transthyretin component since this form of amyloid protein is produced in the liver.